The Medal of Honor. It is the highest honor that can be given to a member of the U.S. military, often coming at a high price to the recipient. To date, more than 3000 men and one woman have received the Medal of Honor for going above and beyond the call of duty. There is one story in particular that continues to fascinate everyone for a couple of reasons: two men from the same mission received the Medal of Honor and the story itself has evolved into a legend. With that being the case, there are several myths of this harrowing story that we would like to set straight. 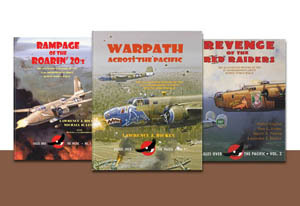 First, a short recap of a B-17 mission that took place on June 16, 1943. This painting depicts B-17E #41-2666, nicknamed LUCY, piloted by Capt. Jay Zeamer, Jr. of the 65th Bomb Squadron, 43rd Bomb Group on June 16, 1943 flying a crucial photomapping mission for the invasion of Bougainville Island in the Solomons later that year. LUCY, alone, without fighter cover, was surrounded and attacked over the objective by eight Japanese Zero fighters from 251 Kokutai. The pilot refused to abort and held the plane on the required straight and level course until his assignment was finished. During the air battle that followed, half of his crew was seriously wounded. The bombardier, 2/Lt. Joseph R. Sarnoski, fought back heroically throughout the engagement until he died of his injuries, earning him the Medal of Honor. Zeamer, although grievously injured himself, was also awarded the Medal of Honor for piloting the B-17 until the mission was complete, then assisting other crewmen on the long flight back to base in the severely damaged bomber, ensuring the safe return of the precious photos. The rest of the crew received the Distinguished Service Cross, the second highest award for valor, making them the most highly decorated American aircrew in history. Zeamer eventually recovered from his near-fatal injures. Unfortunately, as the years have passed, this amazing story has been embellished and those embellishments have been accepted as fact in print and on the screen. We’ve compiled a list of the three worst offenders. Capt. Zeamer and his crew were attacked by 15-21 Japanese fighters. False. Their plane was attacked by eight fighters. Due to the ensuing chaos, it was easy for fighters to be double counted by members of the crew in different areas on the B-17. Some would fall away, smoking as they dove, and those were also potentially double counted. False. While Capt. Zeamer had a hard time getting the hang of the B-26 (it was a tricky plane to fly), he was well-liked by everyone. He was in his element after he transferred from the 22nd to 43rd Bomb Group and started flying the B-17. Zeamer handpicked his crew, looking for men who were disciplined, could keep a cool head during combat, got along well with everyone, and were willing to go the extra mile when needed. LUCY was rescued from the scrap heap. False. Even though this B-17 was known as a “Hard Luck Hattie” because it was so problematic during missions, it was never sent to the boneyard. Still, it wasn’t the best shape when Zeamer acquired it and he and his crew spent a considerable amount of time updating it to their specifications for mapping missions. This is but a brief overview of an epic mission from World War II. 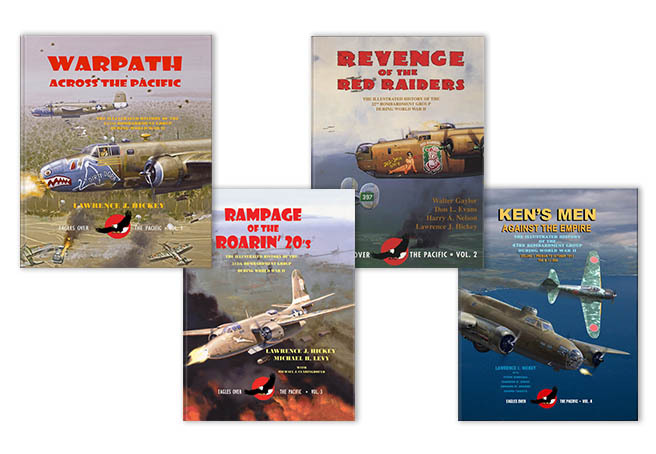 If you want a more detailed account of the mission and LUCY (profiled in Appendix V), buy a copy of our book Ken’s Men Against the Empire, Volume I. You can also head to Clint Hayes’ site for a deep dive into the mission as well as a biography of Capt. Zeamer. Pulling the Thread of History: We’re Heading to History Camp! As we prepare for History Camp Colorado next month, we wanted to give you some insight into how we chose our topic, the disappearance of General Walker’s aircraft on January 5, 1943. For that, we want to introduce you to our Managing Editor, Madison Jonas, who will be giving the presentation. Take it away, Madison! You know what I like about studying history? You get to follow the consequences. Living in the present, it’s hard to ascribe a chain of causality through the actions you take and the events around you. But when we study historical events in detail and with focus, the chain can be linked together. And sometimes, you get an event that has outsize influence—small in isolation, but hugely significant to the events that follow. Such an event occurred on January 5, 1943. 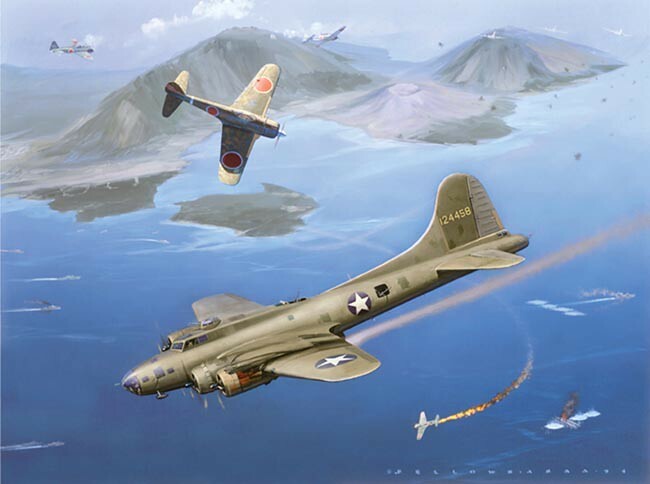 There was an air raid conducted by heavy bombers—B-17s from the 43rd Bomb Group and B-24s from the 90th—based in New Guinea against Simpson Harbor, a major Japanese port in the Southwest Pacific. Going purely by the numbers, it was a small affair: 14 planes attacking, three shot down, two crews rescued, one cargo vessel sunk and three more ships damaged. But the consequences would ultimately shift the nature of the war in New Guinea over the next six months. Unlike prior air raids against Rabaul and Simpson Harbor, the attack on January 5th was a daylight mission. Rabaul was a heavily defended base complex, and beyond the reach of fighter cover, so conventional wisdom had long-range bombers flying small missions at night and doing negligible damage in a token effort to harass the base. General Kenneth Walker, head of V Bomber Command, thought that a massed formation of bombers would be able to defend itself from enemy interception and inflict severe damage on enemy operations. Walker had even flown on the lead plane to assess the battle damage as a proof-of-concept. Tragically, he was lost that day, along with the entire crew of the SAN ANTONIO ROSE. The loss nixed further daylight bombing of Rabaul for the time being. It remained the center of Japanese operations, able to send out reinforcements to New Guinea and the Solomon Islands largely undeterred. Air operations against it saw no major impact until fighter coverage could be brought into range. On January 5, 1943, Brig. Gen. Kenneth N. Walker planned a large daylight raid on Rabaul to disrupt an assembling convoy. Walker was flying as an observer in the lead plane, B-17F-10 SAN ANTONIO ROSE. Over Rabaul, the bomber was hit by flak and then pursued south along the coast of New Britain by a flight of Oscar fighters from 11 Sentai. The location where the B-17 went down is unknown; however, it may have gone down deep in the remote Kol Mountains of New Britain. Two crewmembers, Maj. Jack W. Bleasdale and Capt. Benton H. Daniel, bailed out and survived the shootdown, only to be taken prisoner and executed by the Japanese. General Walker was posthumously awarded the Medal of Honor. Painting by Jack Fellows. The target of the attack on January 5th had been a convoy carrying over 4000 soldiers for a new ground offensive in the mountains of New Guinea. The convoy was scheduled to depart on the 6th, but by a stroke of luck it had been moved to nearby Jacquinot Bay the night before, dodging the strike. The near-miss, however, was shocking to Japanese higher-ups, who ordered additional fighter coverage on the convoy for the duration of its mission, which led to a fierce air battle over the convoy as it unloaded at New Guinea. Those troops were then sent to capture an outlying Allied mountain airbase called Wau, which led to the next ground engagement of the war in the Southwest Pacific. The U.S. also learned from the attempted convoy interception, developing specialized anti-shipping tactics that would lead to the overwhelming victory of Allied air power in the Battle of the Bismarck Sea. The January 5th raid had significant reverberations, and I think this was partly reflected in the decision for General Walker to receive the Medal of Honor for his bravery in organizing and flying on the lead ship of the mission. The full breadth of the story, however, can only be seen in hindsight, with detailed research to piece together all the elements of the story. This is just a general summary—I’ll be delving into far more detail in my seminar at History Camp Colorado on November 12th. The story in full reaches back several days into December and forward into the present day, where the search for General Walker’s B-17 continues. During the air battle that followed, half of his crew was seriously wounded. The bombardier, 2/Lt. Joseph R. Sarnoski, fought back heroically throughout the engagement until he died of his injuries, earning him the Medal of Honor. Zeamer, although grievously injured himself, was also awarded the Medal of Honor for piloting the B-17 until the mission was complete, then assisting other crewmen on the long flight back to base in the severely damaged bomber, ensuring the safe return of the precious photos. The rest of the crew received the Distinguished Service Cross, the second highest award for valor, making them the most highly decorated American aircrew in history. Zeamer eventually recovered from his near-fatal injures. This artwork is published on the cover of our upcoming book Ken’s Men Against the Empire Volume I.